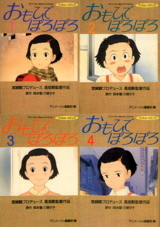 This page contains a listing of books related to Omohide Poro Poro (Only Yesterday). You can order these books through anime import stores listed in our Shopping Guide, though some of these titles may be out of print. If you have additional information on any of these titles, information on any titles we missed, or scans of any of the covers, please let us know. The Art of "Only Yesterday"
Roman Album Extra "Omohide Poro Poro"
This is Animation "Omohide Poro Poro"
Tokuma Anime Ehon "Omohide Poro Poro"
Yamaha Yasashii Piano Piisu 6 "Omohide Poro Poro"
The original manga on which the movie was based. Roman Album Extra: "Omohide Poro Poro"
Hard cover with storybook-style text accompanying frames from the film. Pictures are fairly large and nice to look at. This book contains four songs: "Benihana", "Yokan", "Idol", and "Abe-kun".